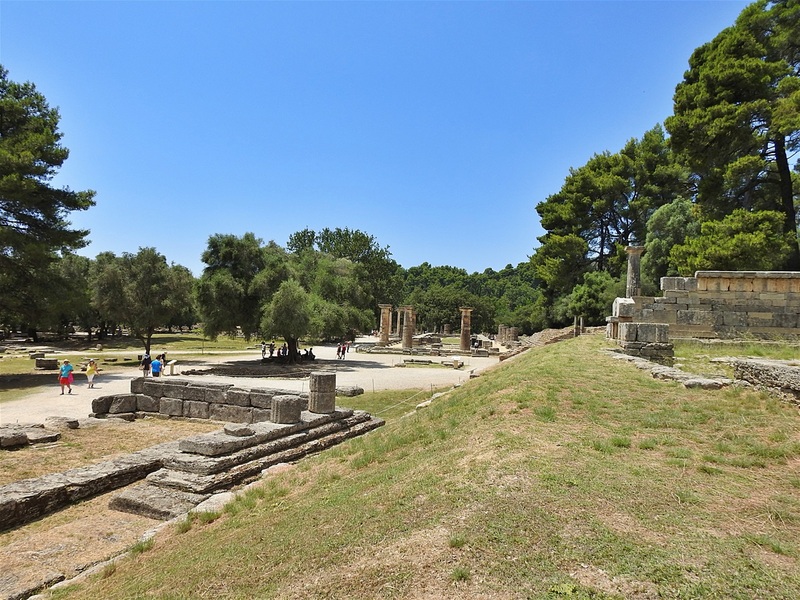 Olympia (Ὀλυμπία), is a small town on the Peloponnese peninsula in Greece, famous for the nearby archaeological site of the same name, which was a major Panhellenic religious sanctuary of ancient Greece, where the ancient Olympic Games were held. 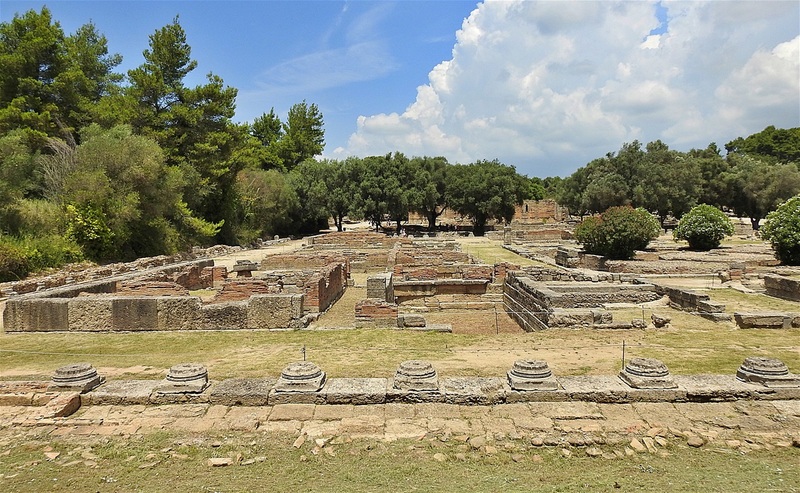 The site was primarily dedicated to Zeus and drew visitors from all over the Greek world as one of a group of such "Panhellenic" centers which helped to build the identity of the ancient Greeks as a nation. The Olympic Games were held every four years throughout Classical antiquity, from the 8th century BC to the 4th century AD. 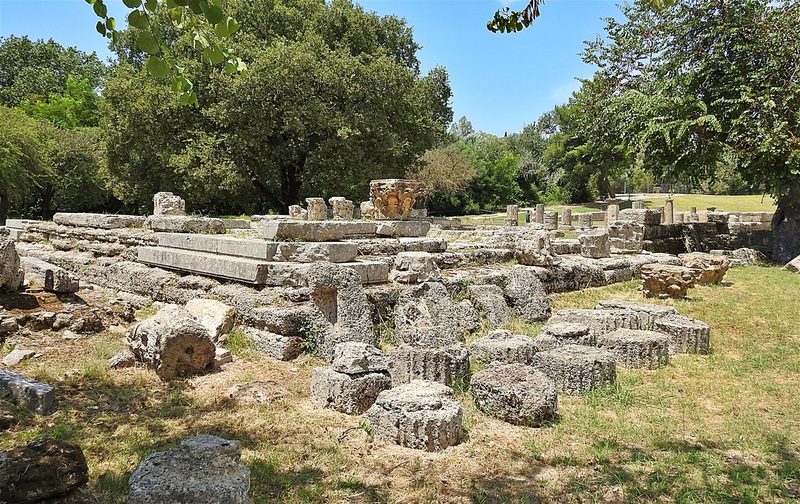 Olympia lies in the wide valley of the rather small Alfeiós River in the western part of the Peloponnese, today around 18 kilometers away from the Ionian Sea, but in antiquity perhaps half that distance. The closest city to Olympia is Pyrgos, located about 20km to the west of the archeological site. Further west (35 km from Olympia) there is a small port, called Katakolon, where cruise ships dock. 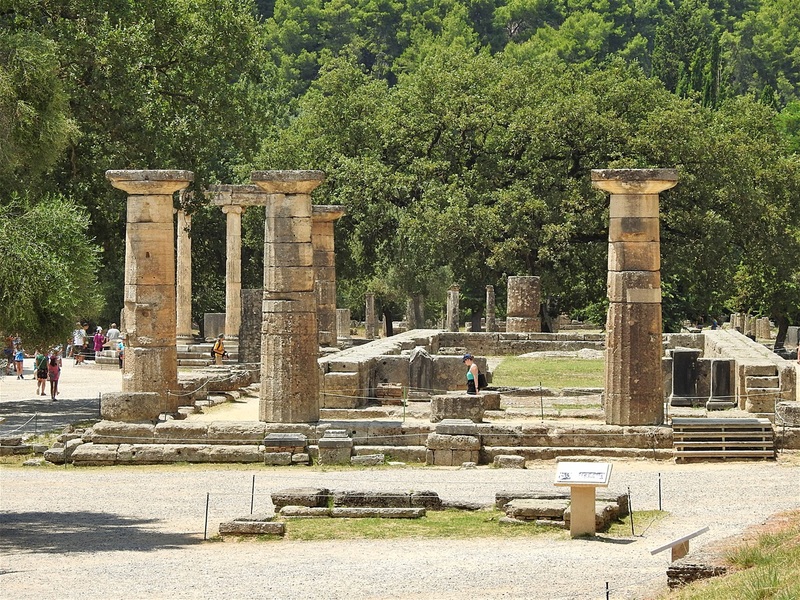 From here tourists can take the bus and visit Olympia. There is also a train connecting Katakolon, Pyrgos and Olympia, but buses are more often. 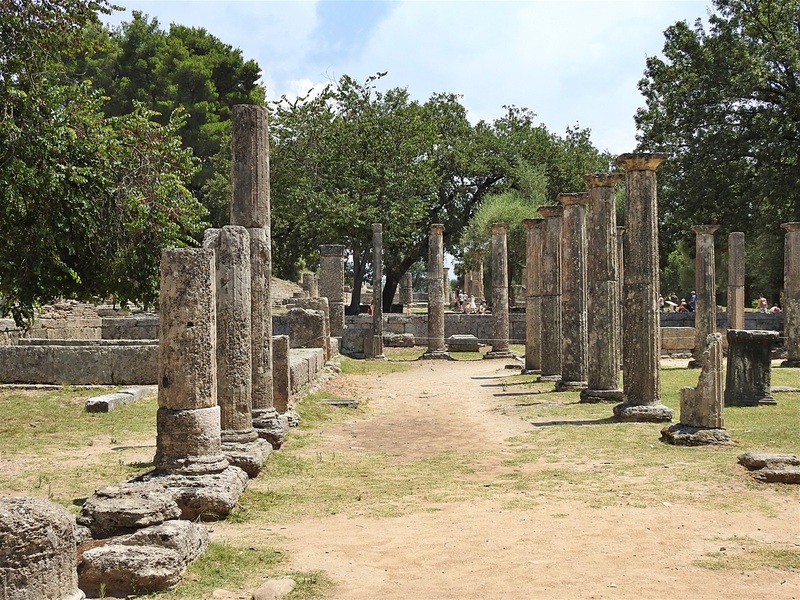 Olympia is a major tourist attraction and has a very important archeological museum devoted to the ancient games. 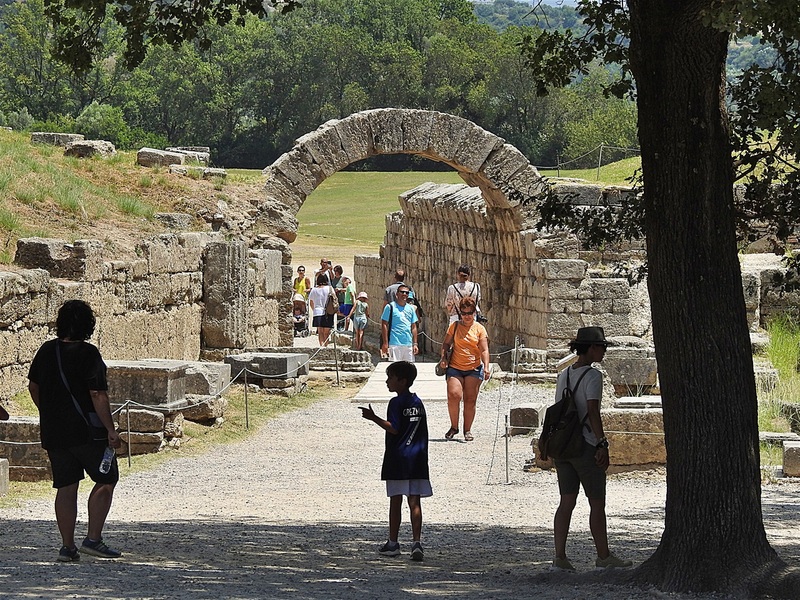 There are also other museums in the area, most important of which is the Museum of the History of the Olympic Games of antiquity. The full ticket to the area costs €12 during the summer period and €6 during the winter period. This ticket includes the visit to the following areas: 1. 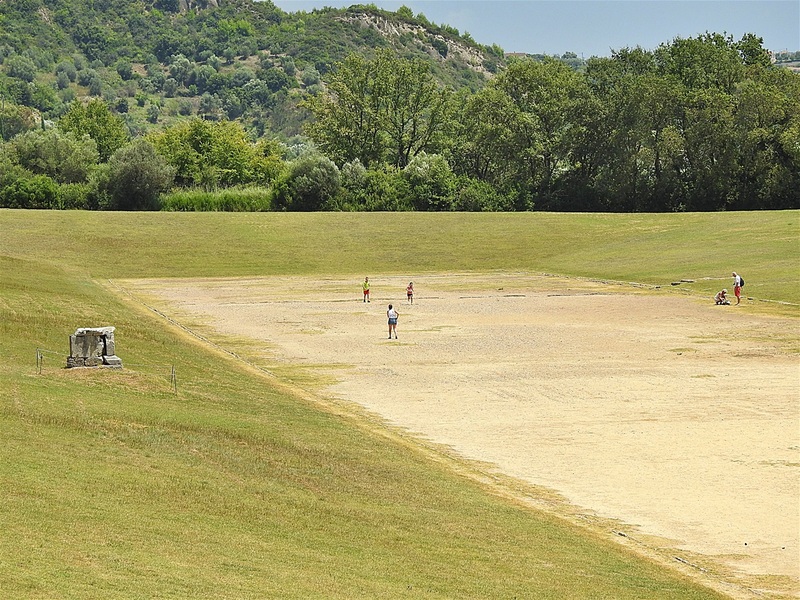 Archaeological Site of Olympia, 2. Archaeological Museum of Olympia 3. 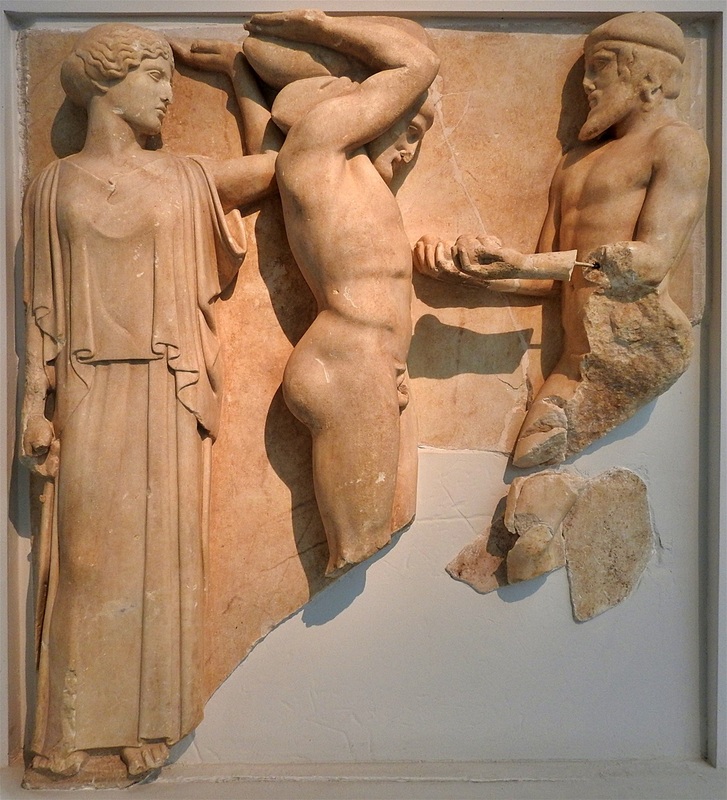 Museum of the History of the Olympic Games of Antiquity and 4. 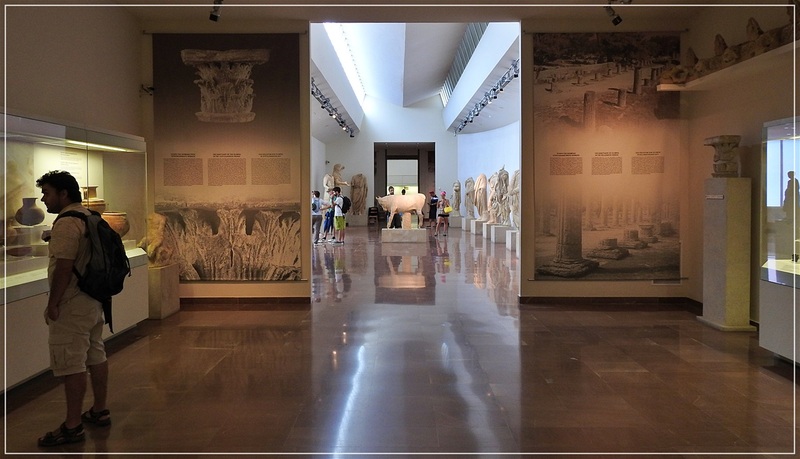 Museum of the History of the Excavations in Olympia. The ticket is valid for one day. 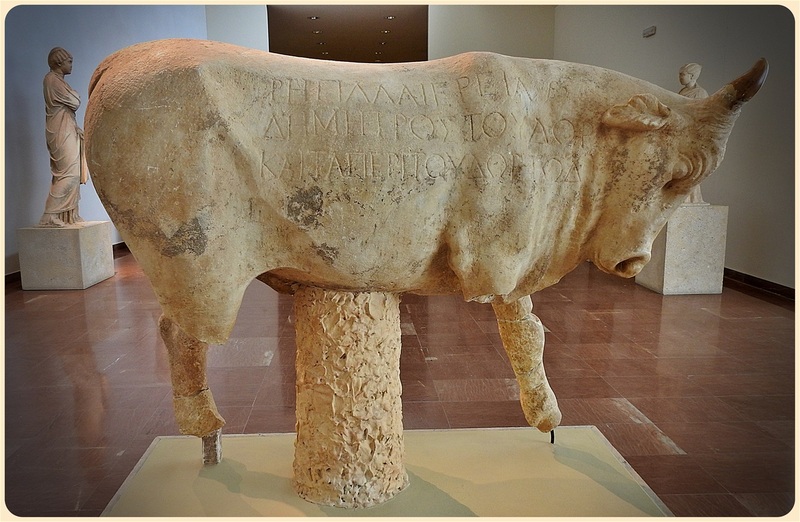 The Archaeological Museum of Olympia. 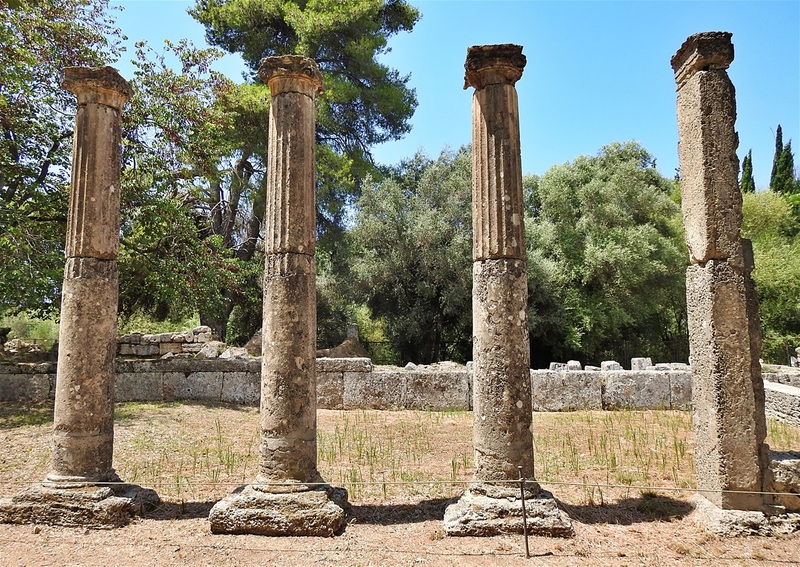 The Archaeological Museum of Olympia, one of the most important museums in Greece, presents the long history of the most celebrated sanctuary of antiquity. 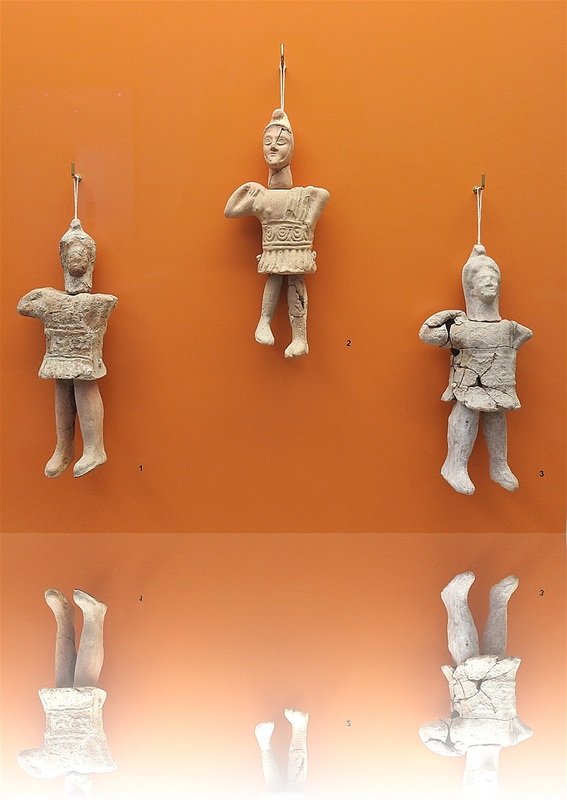 The museum's permanent exhibition contains finds from the excavations in the sacred precinct of the Altis (as the sanctuary was originally known) dating from prehistoric times to the Early Christian period. 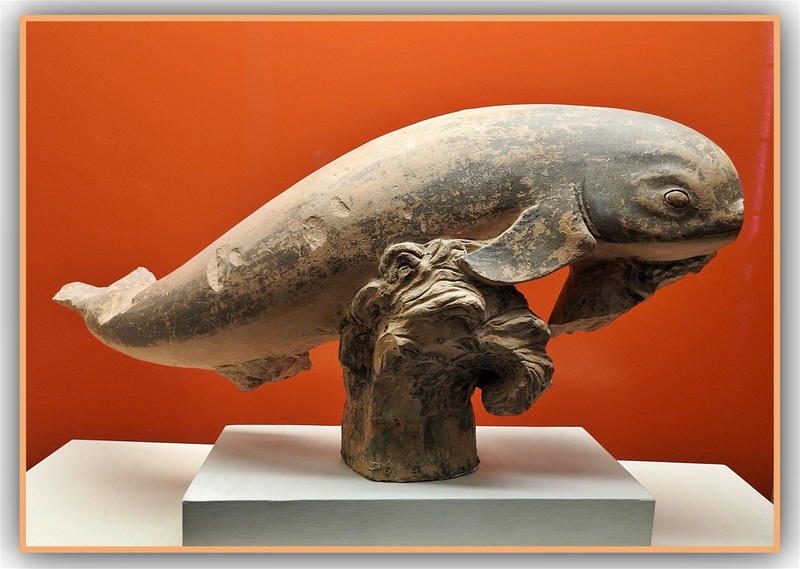 Among the many precious exhibits, the sculpture collection, for which the museum is most famous, the bronze collection, the richest collection of its type in the world, and the large terracotta collection, are especially noteworthy. 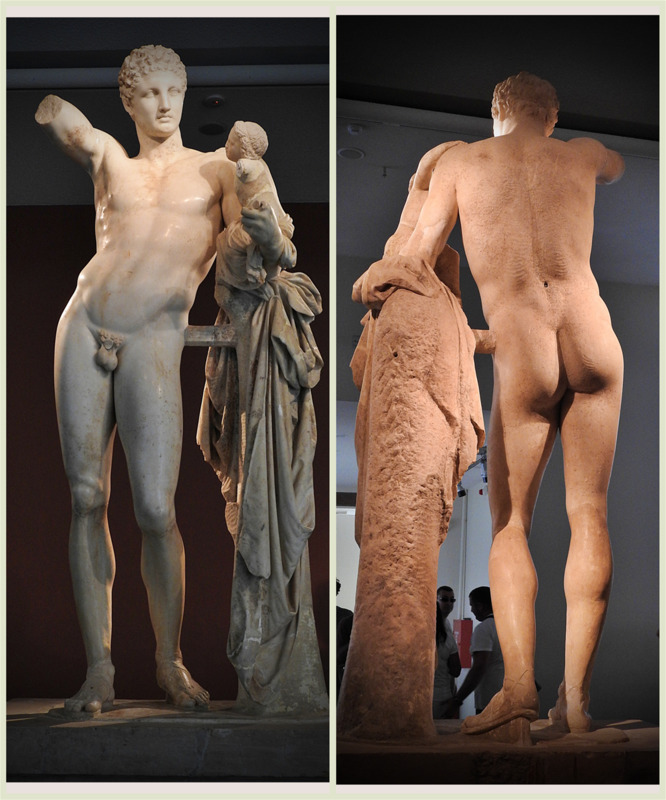 The most famous exhibits are undoubtedly the statue of Hermes by Praxiteles and Apollo, the central figure of the west pediment of the Temple of Zeus. The museum was reorganized in 2004 to meet modern museological standards. East Pediment of the Temple of Zeus, depicting the Pelopas and Oenomaos chariot race. Zeus appears as the central figure. 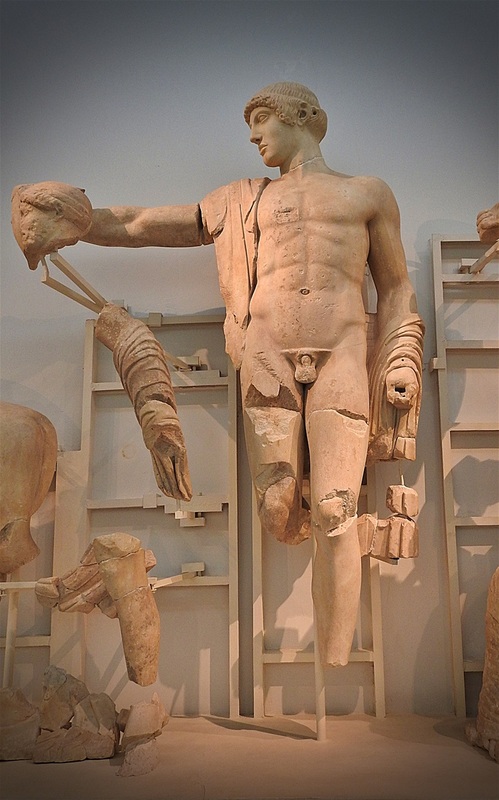 God Apollo is the central figure of the western pediment of the Temple of Zeus. The battle of the Centaurs of the western pediment of the Temple of Zeus, centered on God Apollo. 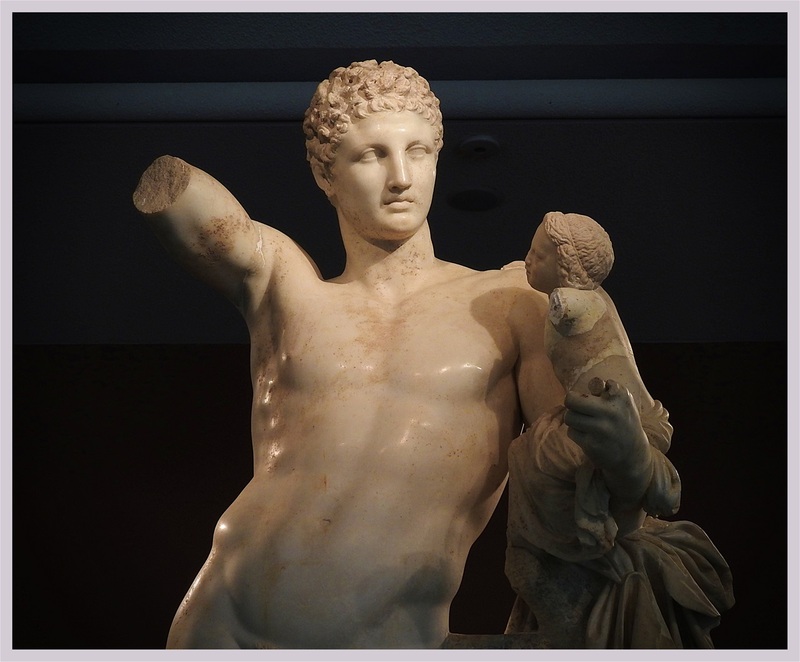 Hermes and the Infant Dionysus, also known as the Hermes of Praxiteles or the Hermes of Olympia is an ancient Greek sculpture of Hermes and the infant Dionysus discovered in 1877 in the ruins of the Temple of Hera. It is traditionally attributed to Praxiteles and dated to the 4th century BC, based on a remark by the 2nd century Greek traveler Pausanias. 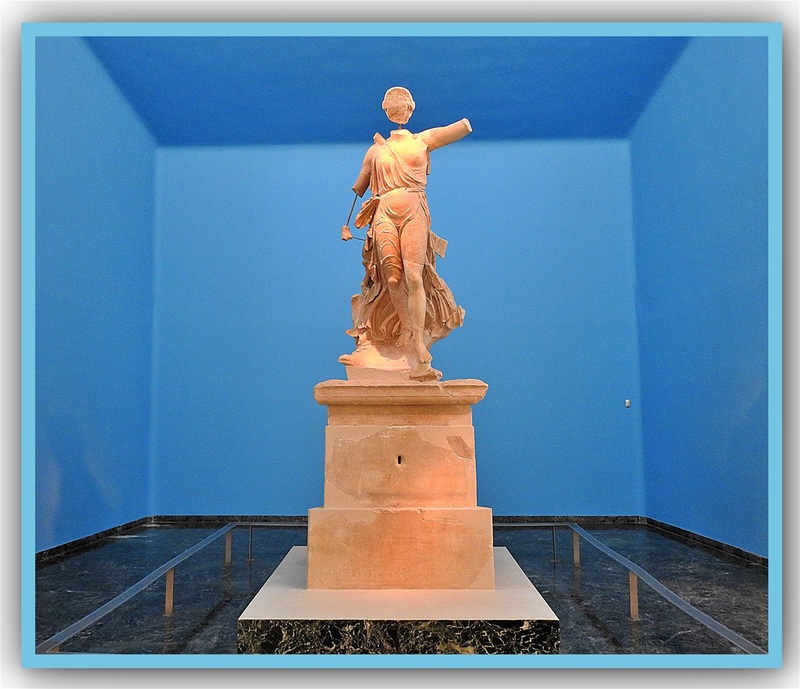 The Nike of Paionios is a statue of the Greek goddess of victory, Nike, made by sculptor Paionios in 425–420 BC. Made of Parian marble, the statue was restored from many fragments, but is lacking face, neck, forearms, part of left leg, toes and some fragments of drapery. It also had wings. The goddess is shown landing gently on her left foot, with the drapery blown against her body. 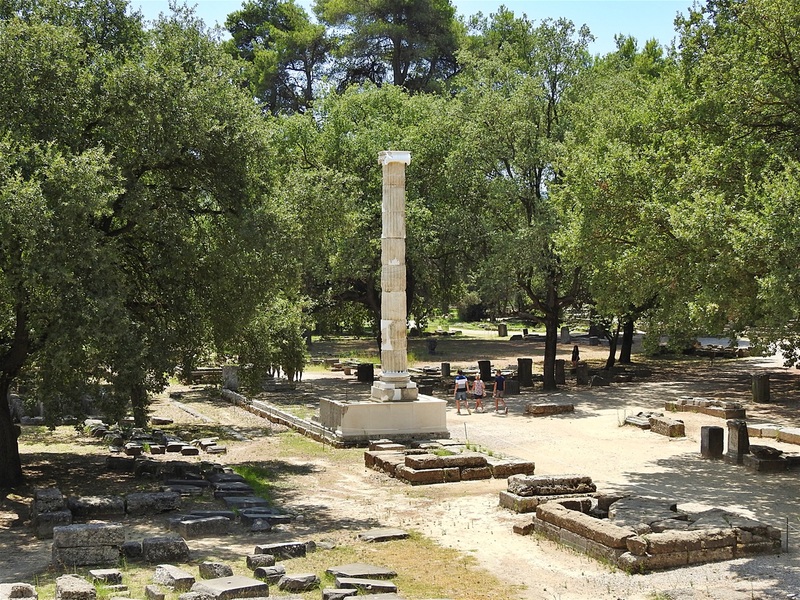 The statue was excavated at Olympia in 1875–76 and originally stood near the temple of Zeus on a triangular 6-metre high pillar. Metope from the freize of the Temple of Zeus, depicting Hercules in one of his 12 labours: "the Golden Apples of the Hesperides"
A dolfin made of terracotta. Children toys (dolls) made of terracotta. Bronze collection. 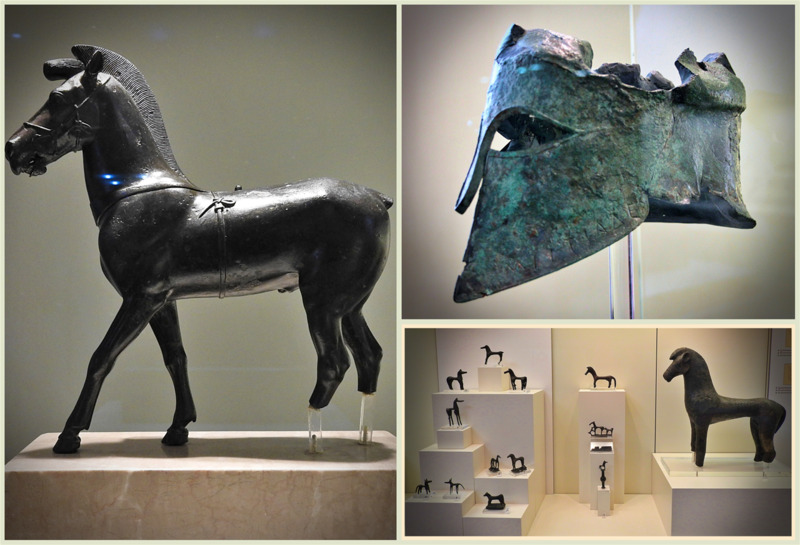 (left): Bronze horse statuette; the posture indicates that it is ready to start walking -about 470 BC. (right): The Helmet of General Miltiadis, bearing the inscription "ΜΙΛΤΙΑΔΕΣ ΑΝΕ[Θ]ΕΚΕΝ [Τ]Ο ΔΙ". Miltiadis dedicated this Helmet to Zeus to thank him for the outcome of the Battle of Marathon. The helmet dome has been destroyed. Terracottas Room. (left): The Group of Zeus and Ganymede is a multi-figure Late Archaic Greek terracotta statue group, depicting Zeus carrying the boy Ganymede off to Mount Olympus. It was created in the first quarter of the fifth century. The group was probably the acroterion of one of the treasuries at Olympia and is attributed to a Corinthian workshop. 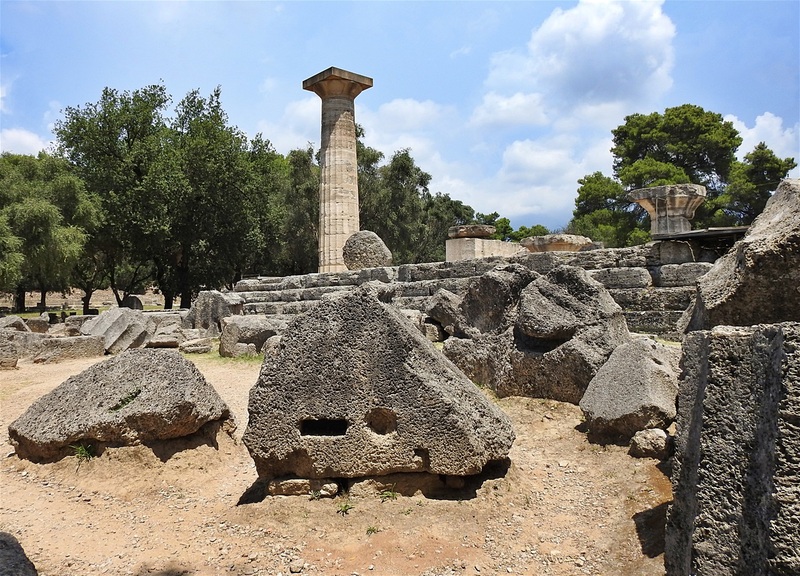 The archaeological site held over 70 significant buildings, and ruins of many of these survive, although the main Temple of Zeus survives only as stones on the ground. The ruins stand in a beautiful scenery, and the best way to visit the site is by just walking around. Doesn't really matter if what you are looking at is "this temple or that building". In the summer the heat can be intense and the sun harsh, so do not forget your hat and a bottle of water. In any case, though, a visit in spring or automn is much more rewarding. 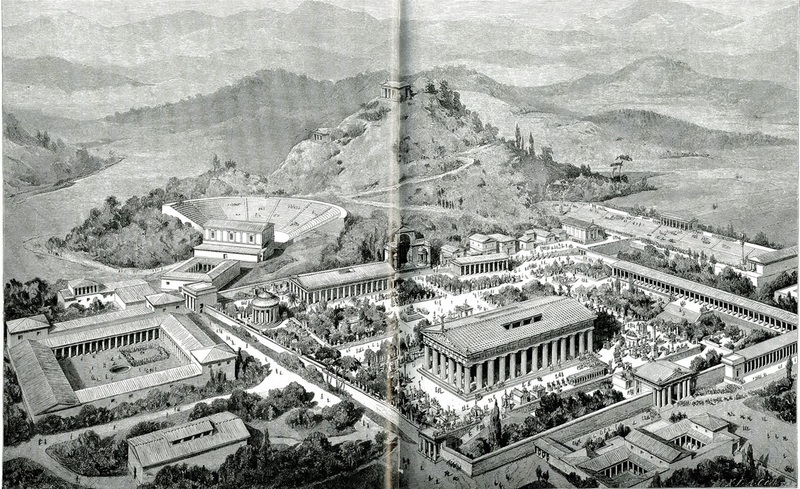 Representation of Olympia as it was in antiquity (19th century). 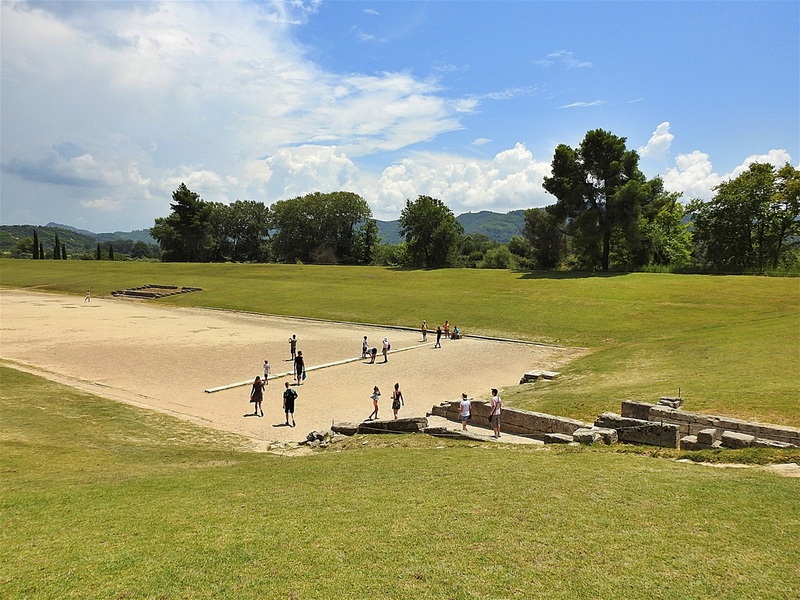 The palaestra is an edifice in Olympia, Greece, part of the gymnasium that was devoted to the training of wrestlers and other athletes. 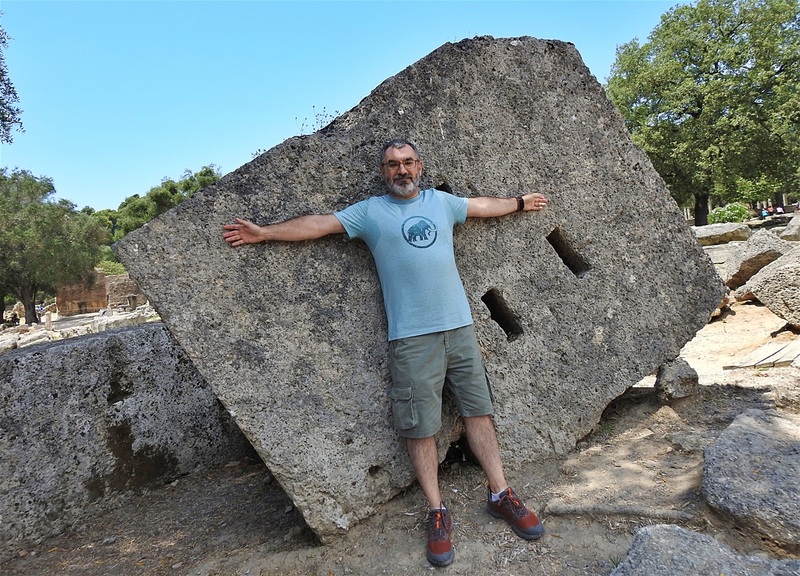 It is a 66 meters by 66 meters building to the end of the 3rd or beginning of the 2nd century BC. Ruins of a Byzantine basilica. 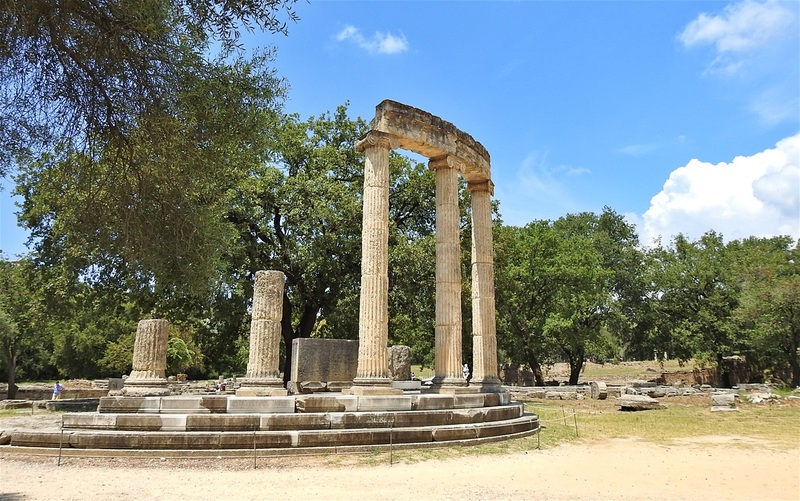 The Philippeion in Olympia was an Ionic circular memorial in limestone and marble, a tholos, which contained chryselephantine (ivory and gold) statues of Philip's family; himself, Alexander the Great, Olympias, Amyntas III and Eurydice I. 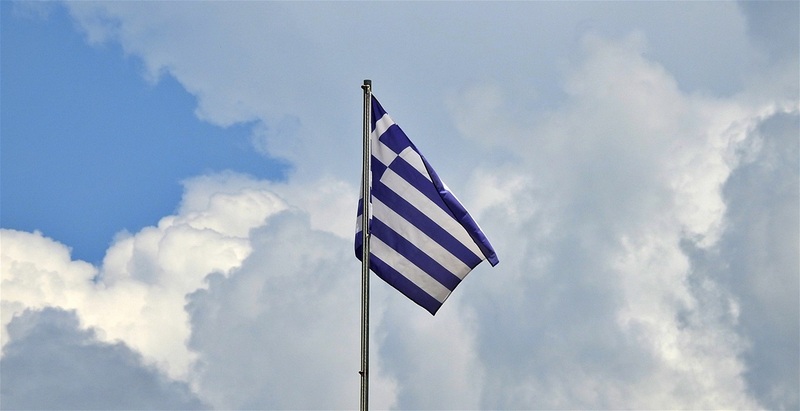 It was made by the Athenian sculptor Leochares in celebration of Philip's victory at the battle of Chaeronea (338 BC). It was the only structure dedicated to a human. 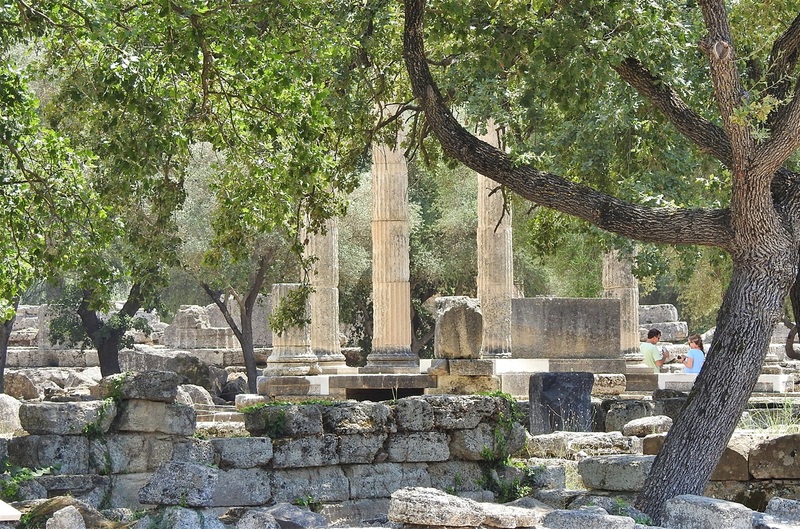 The Temple of Zeus was dedicated to the god Zeus. 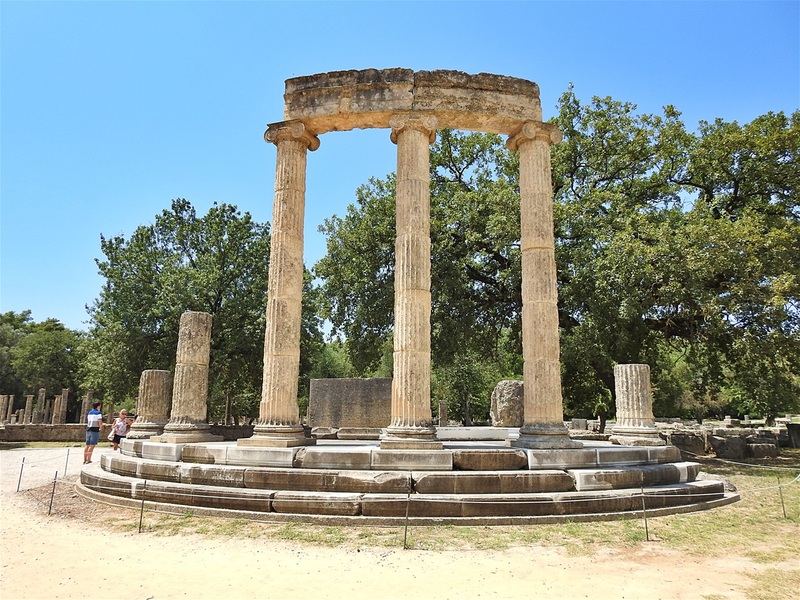 The temple, built in the second quarter of the fifth century BC, was the very model of the fully developed classical Greek temple of the Doric order. The western part of the Temple of Zeus. The Temple of Hera, or Heraion, is an ancient Archaic Greek temple, that was dedicated to Hera, mother of the Greek Gods. The temple was built in approximately 590 BC, but was destroyed by an earthquake in the early 4th century AD. The Treasuries were a series of small temple-shaped buildings located to the north side of the Altis or sanctuary. 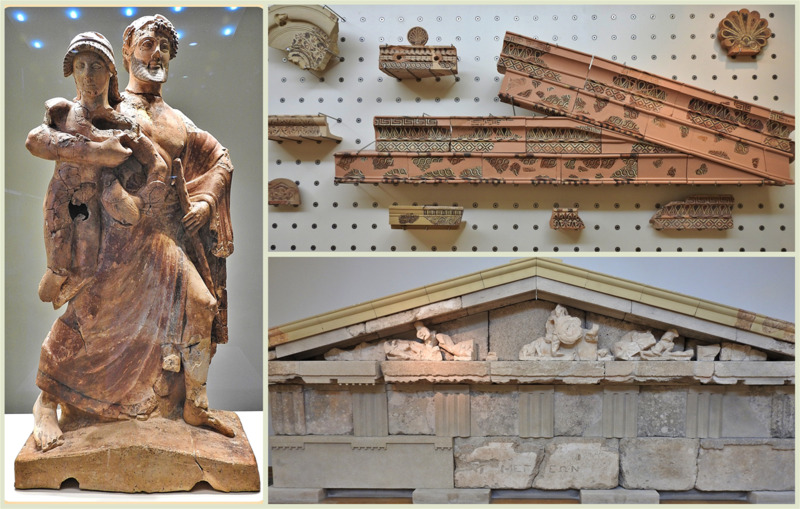 All but two were erected by Greek colonies to store valuable votive offerings. 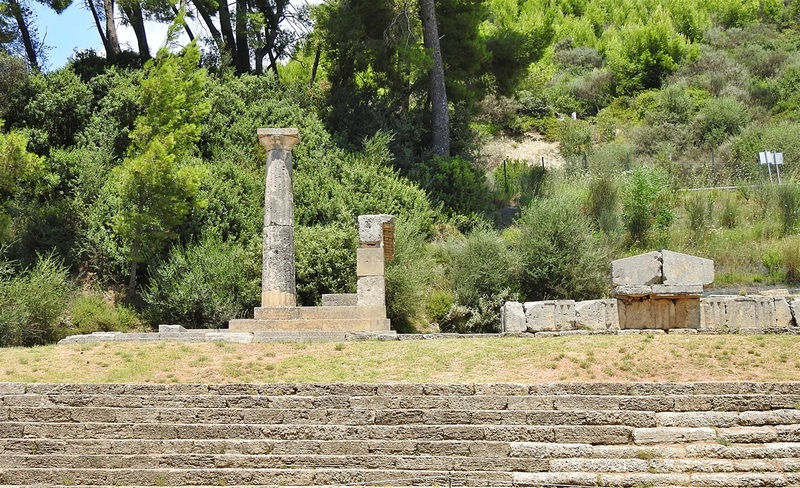 The Leonidaion was the lodging place for athletes taking part in the Olympic Games. It was the largest building on the site. 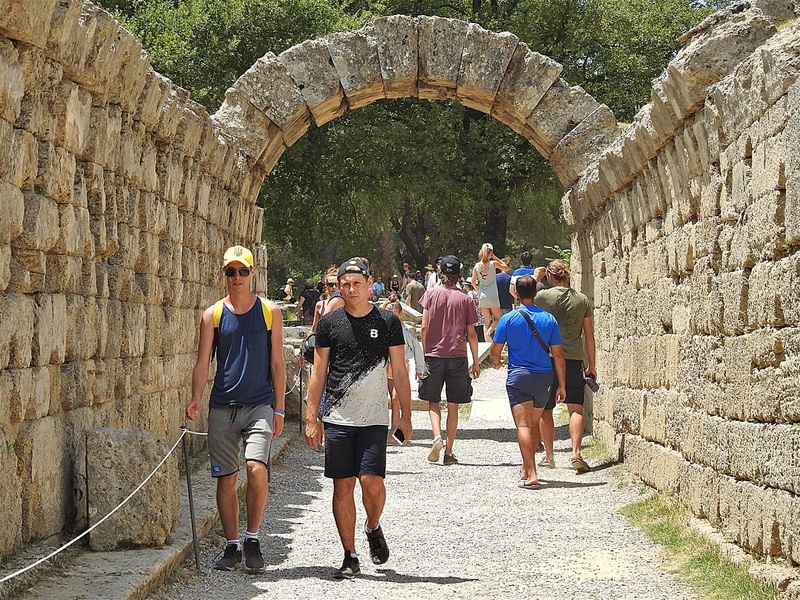 It was constructed around 330 BC and was funded and designed by Leonidas of Naxos. 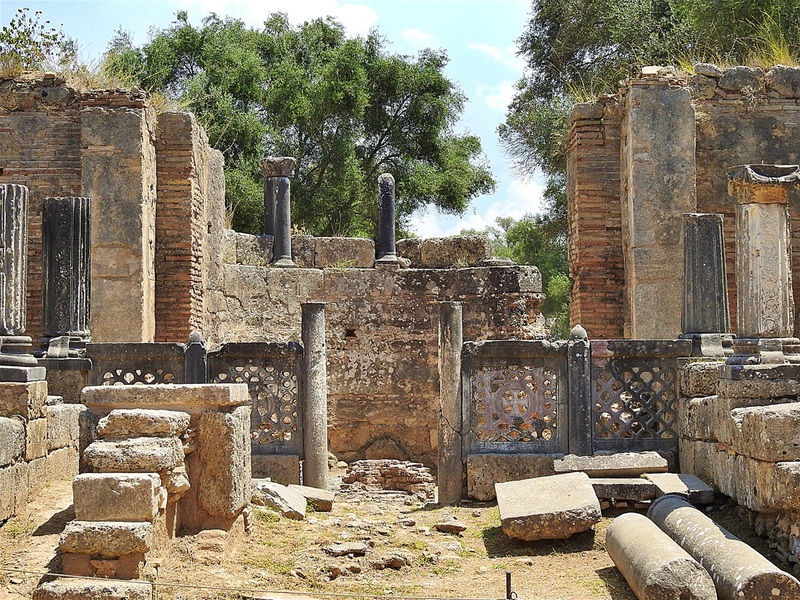 The building consisted of four Ionian colonnades with 138 decorated columns, forming a square of approximately 80 meters. 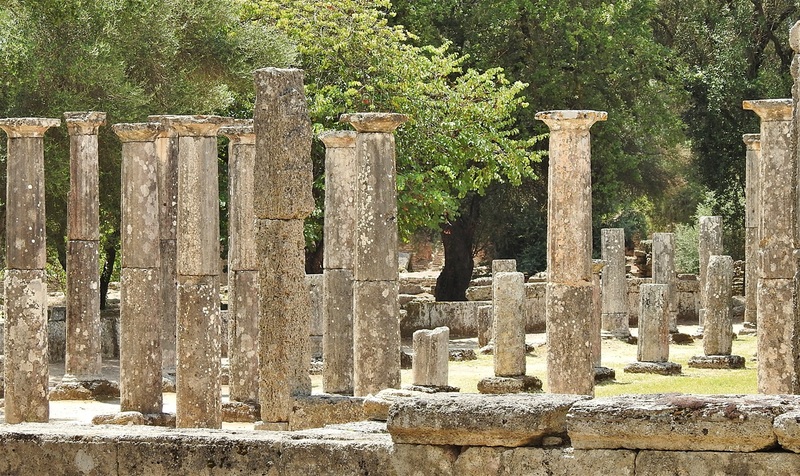 In its interior there was a central Doric peristyle with 44 columns. The Crypt (arched way to the stadium). Crypt (arched way to the stadium). 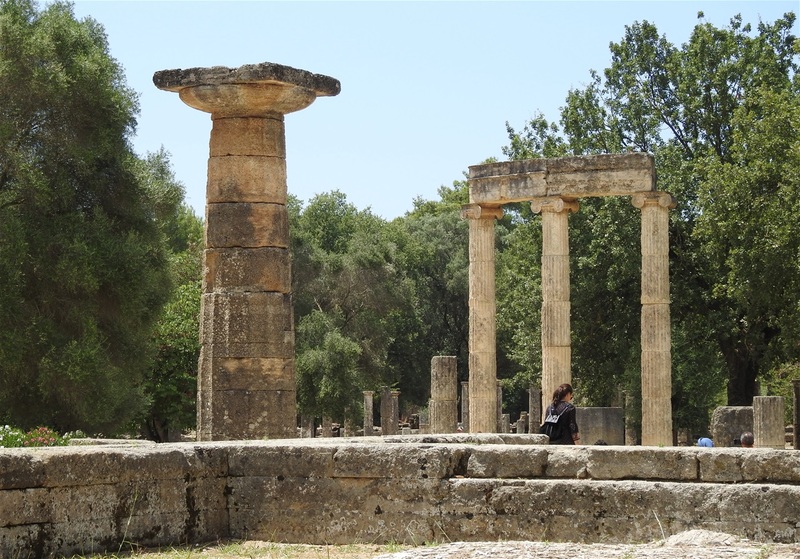 The Treasuries in the foreground and the Temple of Hera in the background. 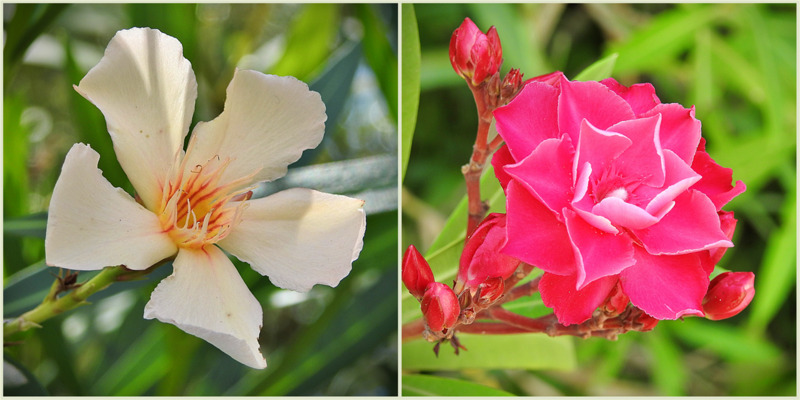 Flora of the archeological site.